Presenting a special edition Aids Awareness red ribbon Christmas tree ornament with authentic crystal Swarovski rhinestones. 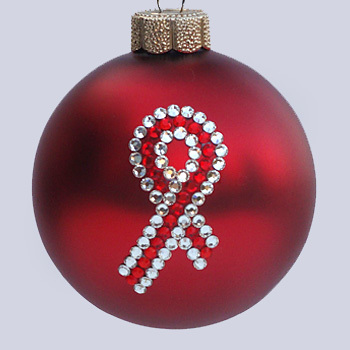 Please note: An Aids Awareness frosted ornament handpainted with authentic Swarovski rhinestones is also available. Ornament also available frosted with a handpainted ribbon outlined by authentic Swarovski rhinestones. Aids Awareness Christmas tree ornaments with authentic Swarovski rhinestones can be purchased at Designer Ornaments. Aids Awareness Christmas tree ornaments depicting a red ribbon can be purchased at Designer Ornaments.